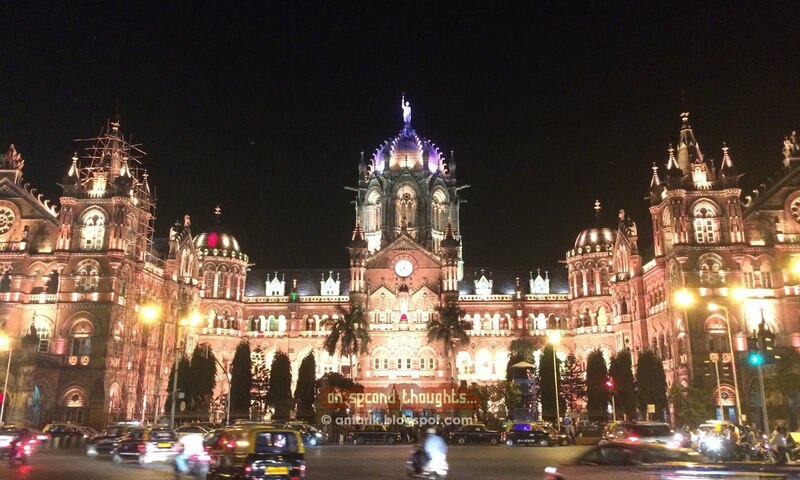 Last weekend I was walking from Gateway of India to Chhatrapati Shivaji Terminus with a few friends from Delhi. We were engulfed in discussions having left the Regal Cinema just minutes ago after watching Tamasha. The idea of a walk to cover the little over 2 kilometres distance wasn’t well-appreciated by my friends, but eventually amidst talks, we did the walk never realising the distance- From Gateway via the Bombay Stock Exchange building and the Elphinstone Circle to CST. Picture this: It is the last week of November, a pleasant Saturday evening sans the usual humidity, art-deco architecture on the illuminated buildings in the Fort area- a blissful experience? For me, it captured the essence of the real Mumbai. The ‘aura’ as we called it, thanks to Walter Benjamin’s 1936 essay from our Cultural Studies classes. I tried initiating a conversation about it with my friends- about experiencing these little things, about remembering these moments as being an integral part of our Mumbai experience. Surprisingly, all I was met with was indifference. I was amazed and realised it at that moment that probably not everyone can appreciate the art & culture that makes a place different from another and probably that’s what differentiates personalities of people. Or perhaps they simply were not interested at that particular moment-thank hunger. It wasn’t until the next day that I actually gave much thought to this. Yes, I don’t like Mumbai for the fact that it mostly looks dull and dirty. But then this aspect of South Mumbai’s beautiful architecture is not found in Delhi or any other city in the country. It is what makes Mumbai Mumbai. Just as the broad and clean roads of the New Delhi Municipal Corporation area make New Delhi New Delhi. A colleague once asked me: ‘What do you wish was different about Mumbai?’ I said- I wish it was cleaner, the roads were wider, and it was a little less congested. Most importantly, I wish it had winters like Delhi. Yes, the winters! It’s December already and I am sitting in a half tshirt and shorts in my room with the fan running at full speed. The humidity has decreased considerably from about a month ago, but if you are out in the afternoons, you might actually drop a sweat. I haven’t got a single piece of winter-wear in the luggage I carried to Mumbai and the office ACs run throughout the day with full power. Yes, I miss the Delhi winters. And I realised that this would be my first birthday when I am not clad in winter-wear. A year without winters. It feels unbelievable, frankly. But then that is what is going to make this period memorable in the long run, right? Q: Did you get my point? Q: Ok, give me a minute and let me get back to you on this. That’s the Bambaiya lingo. It’s not pure Hindi. I find it amusing right now; little weird, to be frank. Who knows, 7 years down the line this might be mixed in my lingo and I might not even realise it. But, this is the authentic thing. It’s a unique way of speaking Hindi that Mumbaikars have that people from other Hindi-speaking areas in India cannot replicate. It’s the aura and the uniqueness of Mumbai and it ought to be appreciated. More importantly, respected. For me, it’s been less than 3 months in Mumbai and there is something new that the place keeps teaching every now and then. It’s the small joys that keep life going, the little things that make memories, the everyday happenings that make stories. The city still keeps me enchanted. It gives me new tales everyday to think about. New experiences to blog about. Best of all, it has brought in a lot of new friends and people into my life. Saying It’s a new phase is perhaps too unrealistic, but changing cities sure has brought in a fresh zeal for doing something new and different in life. There is something romantic about it all. It’s some kind of a well directed play that makes things fall into the right place. Or perhaps it is just something about the ‘aura’ and we are meant to live it.